Three Bean Salad | Cook, Party, Enjoy! It is made with ingredients that can be out without the danger of food poisoning so you don’t have to stress about getting it to refrigeration. thinly sliced red onion and green pepper. Toss to combine set aside while you mix up the dressing. In a jar with tight fitting lid pour all dressing ingredients in any order and then shake to blend. You can also blend dressing in your blender or in a bowl with a whisk. Once mixed, pour dressing over veggies in the bowl, toss together with dressing until all are covered. Cover bowl and refrigerate overnight or at least 6 hours before serving. 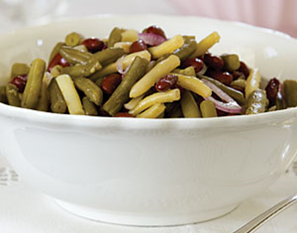 If you like chick peas or lima beans you can add one of these to this salad. 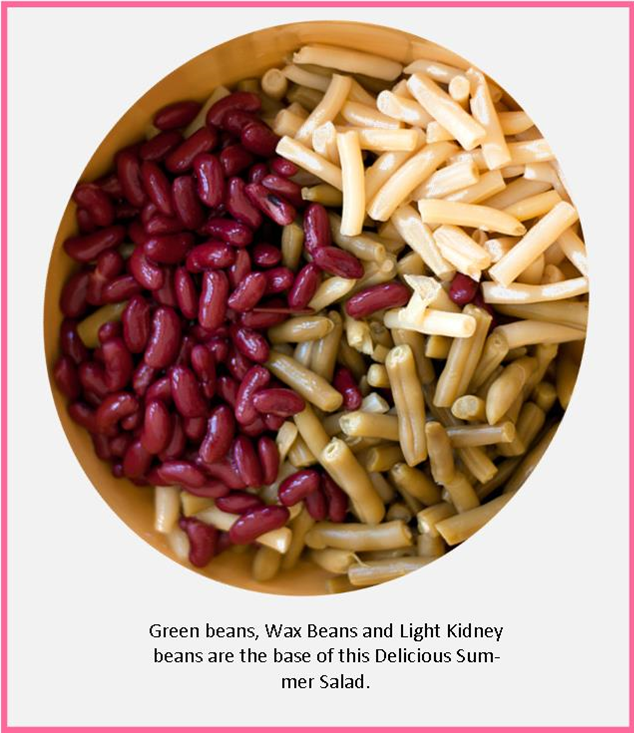 I use the light kidney beans because I have found that the dark beans have a tougher skin and I don’t like that in a salad. They are great in cooked recipes like chili but I like the lighter texture for a chilled salad. To get really thin sliced onions I use my pampered chef mandolin with the cutting blade set close to the surface. It will make your salad so much better as the thin onions really are able to absorb the dressing and they are flavorful and a delight to bite into.